IP security (IPsec) virtual tunnel interfaces (VTIs) provide a routable interface type for terminating IPsec tunnels and an easy way to define protection between sites to form an overlay network. 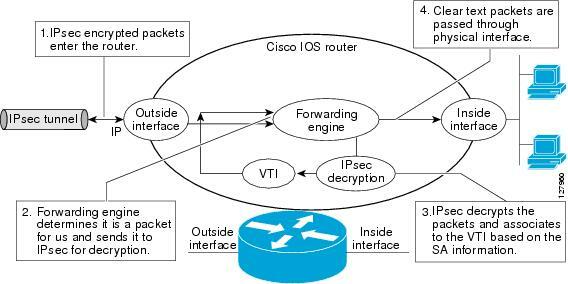 IPsec VTIs simplify configuration of IPsec for protection of remote links, support multicast, and simplify network management and load balancing. Your software release may not support all the features documented in this module. For the latest feature information and caveats, see the release notes for your platform and software release. To find information about the features documented in this module, and to see a list of the releases in which each feature is supported, see the "Feature Information for IPsec Virtual Tunnel Interface" section. The IPsec transform set must be configured in tunnel mode only. The Internet Key Exchange (IKE) security association (SA) is bound to the VTI. Because IKE SA is bound to the VTI, the same IKE SA cannot be used for a crypto map. Static VTIs support only a single IPsec SA that is attached to the VTI interface. The traffic selector for the IPsec SA is always "IP any any." A dynamic VTI also is a point-point interface that supports only a single IPsec SA, but the dynamic VTI is flexible in that it can accept the IPsec selectors that are proposed by the initiator. Static VTIs support only the "IP any any" proxy. Dynamic VTIs support only one proxy, which can be "IP any any" or any subset of it. The shaped traffic is process switched. IPsec stateful failover is not supported with IPsec VTIs. The shared keyword is not required and must not be configured when using the tunnel mode ipsec ipv4 command for IPsec IPv4 mode. The IPsec VTI is limited to IP unicast and multicast traffic only, as opposed to GRE tunnels, which have a wider application for IPsec implementation. In VRF-aware IPsec configurations with either static or dynamic VTIs (DVTIs), the VRF must not be configured in the Internet Security Association and Key Management Protocol (ISAKMP) profile. Instead, the VRF must be configured on the tunnel interface for static VTIs. For DVTIs, you must apply VRF to the virtual template using the ip vrf forwarding command. The use of IPsec VTIs both greatly simplifies the configuration process when you need to provide protection for remote access and provides a simpler alternative to using generic routing encapsulation (GRE) or Layer 2 Tunneling Protocol (L2TP) tunnels for encapsulation and crypto maps with IPsec. A major benefit associated with IPsec VTIs is that the configuration does not require a static mapping of IPsec sessions to a physical interface. The IPsec tunnel endpoint is associated with an actual (virtual) interface. Because there is a routable interface at the tunnel endpoint, many common interface capabilities can be applied to the IPsec tunnel. The IPsec VTI allows for the flexibility of sending and receiving both IP unicast and multicast encrypted traffic on any physical interface, such as in the case of multiple paths. Traffic is encrypted or decrypted when it is forwarded from or to the tunnel interface and is managed by the IP routing table. Using IP routing to forward the traffic to the tunnel interface simplifies the IPsec VPN configuration compared to the more complex process of using access control lists (ACLs) with the crypto map in native IPsec configurations. DVTIs function like any other real interface so that you can apply quality of service (QoS), firewall, and other security services as soon as the tunnel is active. Without Virtual Private Network (VPN) Acceleration Module2+ (VAM2+) accelerating virtual interfaces, the packet traversing an IPsec virtual interface is directed to the router processor (RP) for encapsulation. This method tends to be slow and has limited scalability. In hardware crypto mode, all the IPsec VTIs are accelerated by the VAM2+ crypto engine, and all traffic going through the tunnel is encrypted and decrypted by the VAM2+. IPsec VTIs allow you to configure a virtual interface to which you can apply features. Features for clear-text packets are configured on the VTI. Features for encrypted packets are applied on the physical outside interface. When IPsec VTIs are used, you can separate the application of features such as NAT, ACLs, and QoS and apply them to clear-text or encrypted text, or both. When crypto maps are used, there is no simple way to apply encryption features to the IPsec tunnel. There are two types of VTI interfaces: static VTIs (SVTIs) and dynamic VTIs (DVTIs). SVTI configurations can be used for site-to-site connectivity in which a tunnel provides always-on access between two sites. The advantage of using SVTIs as opposed to crypto map configurations is that users can enable dynamic routing protocols on the tunnel interface without the extra 4 bytes required for GRE headers, thus reducing the bandwidth for sending encrypted data. Additionally, multiple Cisco IOS software features can be configured directly on the tunnel interface and on the physical egress interface of the tunnel interface. This direct configuration allows users to have solid control on the application of the features in the pre- or post-encryption path. Figure 1 illustrates how a static VTI is used. The IPsec VTI supports native IPsec tunneling and exhibits most of the properties of a physical interface. DVTIs can provide highly secure and scalable connectivity for remote-access VPNs. The DVTI technology replaces dynamic crypto maps and the dynamic hub-and-spoke method for establishing tunnels. Dynamic VTIs can be used for both the server and remote configuration. The tunnels provide an on-demand separate virtual access interface for each VPN session. The configuration of the virtual access interfaces is cloned from a virtual template configuration, which includes the IPsec configuration and any Cisco IOS software feature configured on the virtual template interface, such as QoS, NetFlow, or ACLs. Dynamic VTIs function like any other real interface so that you can apply QoS, firewall, other security services as soon as the tunnel is active. QoS features can be used to improve the performance of various applications across the network. Any combination of QoS features offered in Cisco IOS software can be used to support voice, video, or data applications. Dynamic VTIs provide efficiency in the use of IP addresses and provide secure connectivity. Dynamic VTIs allow dynamically downloadable per-group and per-user policies to be configured on a RADIUS server. The per-group or per-user definition can be created using extended authentication (Xauth) User or Unity group, or it can be derived from a certificate. Dynamic VTIs are standards based, so interoperability in a multiple-vendor environment is supported. IPsec DVTIs allow you to create highly secure connectivity for remote access VPNs and can be combined with Cisco Architecture for Voice, Video, and Integrated Data (AVVID) to deliver converged voice, video, and data over IP networks. The DVTI simplifies Virtual Private Network (VRF) routing and forwarding- (VRF-) aware IPsec deployment. The VRF is configured on the interface. A DVTI requires minimal configuration on the router. A single virtual template can be configured and cloned. The DVTI creates an interface for IPsec sessions and uses the virtual template infrastructure for dynamic instantiation and management of dynamic IPsec VTIs. The virtual template infrastructure is extended to create dynamic virtual-access tunnel interfaces. Dynamic VTIs are used in hub-and-spoke configurations. A single DVTI can support several static VTIs. Figure 2 illustrates the DVTI authentication path. 1. User 1 calls the router. 2. Router 1 authenticates User 1. 3. IPsec clones virtual access interface from virtual template interface. IPsec profiles define policy for dynamic VTIs. The dynamic interface is created at the end of IKE Phase 1 and IKE Phase 1.5. The interface is deleted when the IPsec session to the peer is closed. The IPsec session is closed when both IKE and IPsec SAs to the peer are deleted. Because VTIs are routable interfaces, routing plays an important role in the encryption process. Traffic is encrypted only if it is forwarded out of the VTI, and traffic arriving on the VTI is decrypted and routed accordingly. VTIs allow you to establish an encryption tunnel using a real interface as the tunnel endpoint. You can route to the interface or apply services such as QoS, firewalls, network address translation, and Netflow statistics as you would to any other interface. You can monitor the interface, route to it, and it has an advantage over crypto maps because it is a real interface and provides the benefits of any other regular Cisco IOS interface. When an IPsec VTI is configured, encryption occurs in the tunnel. Traffic is encrypted when it is forwarded to the tunnel interface. Traffic forwarding is handled by the IP routing table, and dynamic or static routing can be used to route traffic to the SVTI. DVTI uses reverse route injection to further simplify the routing configurations. Using IP routing to forward the traffic to encryption simplifies the IPsec VPN configuration because the use of ACLs with a crypto map in native IPsec configurations is not required. The IPsec virtual tunnel also allows you to encrypt multicast traffic with IPsec. IPsec packet flow into the IPsec tunnel is illustrated in Figure 3. After packets arrive on the inside interface, the forwarding engine switches the packets to the VTI, where they are encrypted. The encrypted packets are handed back to the forwarding engine, where they are switched through the outside interface. Figure 4 shows the packet flow out of the IPsec tunnel. The Per-User Attribute Support for Easy VPN Servers feature provides users with the ability to support per-user attributes on Easy VPN servers. These attributes are applied on the virtual access interface. For a local Easy VPN AAA server, the per-user attributes can be applied at the group level or at the user level using the command-line interface (CLI). To configure per-user attributes for a local Easy VPN server, see "Configuring Per-User Attributes on a Local Easy VPN AAA Server." This configuration shows how to configure a static IPsec VTI. Defines the IPsec parameters that are to be used for IPsec encryption between two IPsec routers. Specifies which transform sets can be used with the crypto map entry. Specifies the interface on which the tunnel will be configured and enters interface configuration mode. Specifies the IP address and mask. Defines the mode for the tunnel. Specifies the tunnel source as a loopback interface. Identifies the IP address of the tunnel destination. Associates a tunnel interface with an IPsec profile. This task shows how to configure a dynamic IPsec VTI. Defines a virtual-template tunnel interface and enters interface configuration mode. Defines the ISAKAMP profile to be used for the virtual template. Specifies the virtual template attached to the ISAKAMP profile. To configure per-user attributes on a local Easy VPN AAA server, perform the following steps. Defines a AAA attribute list locally on a router and enters attribute list configuration mode. Defines an attribute type that is to be added to an attribute list locally on a router. Exits attribute list configuration mode. Specifies to which group a policy profile will be defined and enters ISAKMP group configuration mode. Defines a AAA attribute list locally on a router. The following example configuration uses a preshared key for authentication between peers. VPN traffic is forwarded to the IPsec VTI for encryption and then sent out the physical interface. The tunnel on subnet 10 checks packets for IPsec policy and passes them to the Crypto Engine (CE) for IPsec encapsulation. 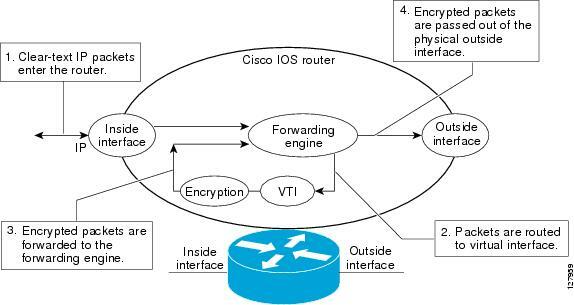 Figure 5 illustrates the IPsec VTI configuration. This section provides information that you can use to confirm that your configuration is working properly. In this display, Tunnel 0 is "up," and the line protocol is "up." If the line protocol is "down," the session is not active. To add VRF to the static VTI example, include the ipvrf and ip vrf forwarding commands to the configuration as shown in the following example. You can apply any QoS policy to the tunnel endpoint by including the service-policy statement under the tunnel interface. The following example is policing traffic out the tunnel interface. 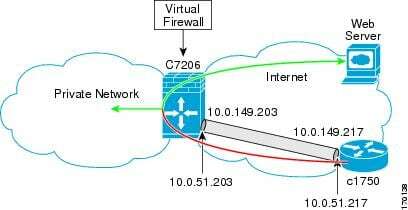 Applying the virtual firewall to the static VTI tunnel allows traffic from the spoke to pass through the hub to reach the internet. Figure 6 illustrates a static VTI with the spoke protected inherently by the corporate firewall. The basic static VTI configuration has been modified to include the virtual firewall definition. The following example illustrates the use of the DVTI Easy VPN server, which serves as an IPsec remote access aggregator. The client can be a home user running a Cisco VPN client or it can be a Cisco IOS router configured as an Easy VPN client. The following examples show that a dynamic VTI has been configured for an Easy VPN server. The following example shows how you can set up a router as the Easy VPN client. This example uses basically the same idea as the Easy VPN client that you can run from a PC to connect. In fact, the configuration of the Easy VPN server will work for the software client or the Cisco IOS client. The client definition can be set up in many different ways. The mode specified with the connect command can be automatic or manual. If the connect mode is set to manual, the IPsec tunnel has to be initiated manually by a user. Also note use of the mode command. The mode can be client, network-extension, or network-extension-plus. This example indicates client mode, which means that the client is given a private address from the server. Network-extension mode is different from client mode in that the client specifies for the server its attached private subnet. Depending on the mode, the routing table on either end will be slightly different. The basic operation of the IPSec tunnel remains the same, regardless of the specified mode. The following examples illustrate different ways to display the status of the DVTI. The DVTI Easy VPN server can be configured behind a virtual firewall. Behind-the-firewall configuration allows users to enter the network, while the network firewall is protected from unauthorized access. The virtual firewall uses Context-Based Access Control (CBAC) and NAT applied to the Internet interface as well as to the virtual template. You can add QoS to the DVTI tunnel by applying the service policy to the virtual template. When the template is cloned to make the virtual-access interface, the service policy will be applied there. The following example shows the basic DVTI configuration with QoS added. The following example shows that per-user attributes have been configured on an Easy VPN server. The following sections provide references related to the IPsec virtual tunnel interface feature. Cisco IOS Security Configuration Guide: Secure Connectivity, Release 15.0. IPsec VTIs (VTIs) provide a routable interface type for terminating IPsec tunnels and an easy way to define protection between sites to form an overlay network. IPsec VTIs simplify configuration of IPsec for protection of remote links, support multicast, and simplify network management and load balancing. Static tunnel interfaces can be configured to encapsulate IPv6 or IPv4 packets in IPv6. Dynamic VTIs provide efficiency in the use of IP addresses and provide secure connectivity. Dynamic VTIs allow dynamically downloadable per-group and per-user policies to be configured on a RADIUS server. The per-group or per-user definition can be created using Xauth User or Unity group, or it can be derived from a certificate. Dynamic VTIs are standards based, so interoperability in a multiple-vendor environment is supported. IPsec dynamic VTIs allow you to create highly secure connectivity for remote access VPNs and can be combined with Cisco Architecture for Voice, Video, and Integrated Data (AVVID) to deliver converged voice, video, and data over IP networks. The dynamic VTI simplifies VRF-aware IPsec deployment. The VRF is configured on the interface. This feature provides per-user attribute support on an Easy VPN server. The following commands were added or modified by this feature: crypto aaa attribute list and crypto isakmp client configuration group.